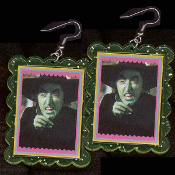 HUGE Wizard of Oz - The WICKED WITCH-of-the-WEST EARRINGS - Funky Ruby Slippers Villain Novelty Jewelry - BIG clear green glitter plastic frame toy Margaret Hamilton photo charms, 1-7/8-inch (4.69cm) x 1.5-inch (3.75cm) . I'll Get You by releasing my Flying Monkeys, My Pretty. Dah-da-da-dah-da-dah-da!